The Preserve is a place set apart. It is 36 acres reserved for just 18 single-family residential lots. More than a subdivision, The Preserve is a natural area of intrinsic beauty. Located in Pamlico County, The Preserve fronts the Lower Broad Creek and consists of mainly uplands, woodlands with tall pines and hardwoods with some natural wetlands marsh grass areas. Red Oak and Water Oak are two more popular trees in the subdivision. Each lot in the Preserve conveys with a boat slip. The Preserve also offers a community dock and marina so water access and North Carolina’s great fishing will always be available to you. While maintaining nature’s integrity, The Preserve accounts for all necessary conveniences. Utilities available to the property include electricity, telephone and county water. Wastewater disposal is provided in the neighborhood and to subject property by on-site and off-site septic systems. The subject property is located outside the city limits and zoning jurisdiction of Oriental. 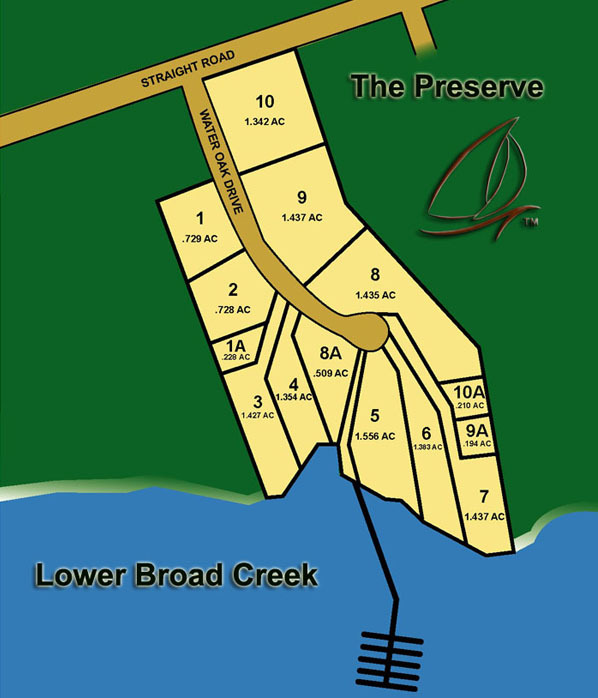 The Preserve large lots with boat slip prices start from $59,990. For maps, directions, prices & more info contact us today.